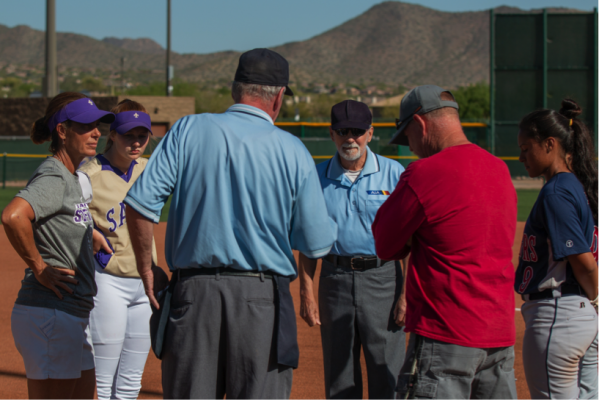 It was an ordinary Friday afternoon softball game; the second game in as many days between the McClintock Chargers and the Notre Dame Prep Saints. But for the two coaches in the dugout, this game was anything but ordinary. 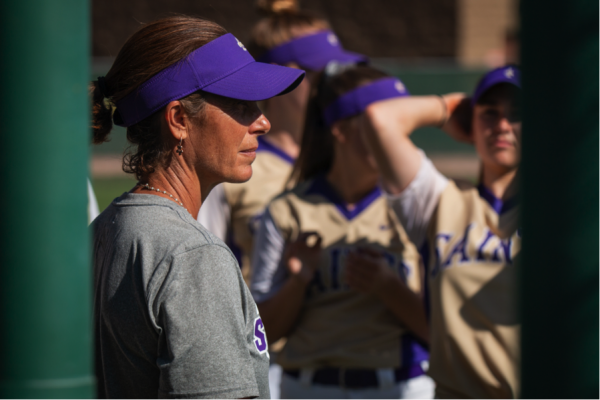 Charlie Marshall, the head coach at McClintock, has known Kim Braatz-Voisard, the head coach at Notre Dame Prep, for almost a decade. He helped her get her first coaching job in the Valley, as a volunteer assistant with the Chargers. This is Braatz-Voisard’s first season as head coach of the Saints, a program that has had five coaches in the past seven years and has endured losing seasons since 2012. For Braatz-Voisard, losing isn’t in her DNA. She was an All-American softball player at the University of New Mexico. She played women’s baseball with the Colorado Silver Bullets, a team that barnstormed around the country and competed against top men’s amateur teams in the late 1990’s. In 1996, she was the first woman to hit an out-of-the-park home run off a male pitcher. She won two gold medals in the 2004 and 2006 IBAF Women’s Baseball World Cup as an outfielder with the USA Women’s Baseball team. 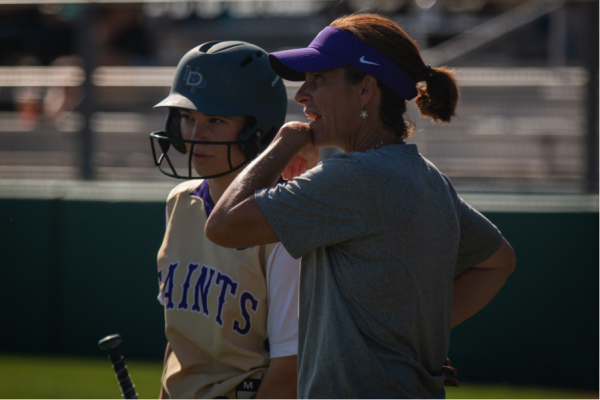 When she took over the Saints program this year, her goal was to bring a culture of integrity, commitment and intensity to this program. 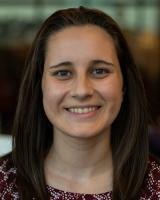 While the team hasn’t had a miraculous turnaround this season (5-10, 5-5), Braatz-Voisard believes they have turned a page in recent weeks, and her players agree with her. Coaching has never been a grand dream for Braatz-Voisard though. It’s something she just kind of fell into. She started coaching because that was what she knew how to do, “but really it was my heart for the kids,” she said that kept her in it. They motivate her, especially when she has struggled to support her family as a single mother. Both her family and faith have dictated the trajectory of her career. She always knew that being a mother was important to her, so taking care of her son and supporting her family became her biggest priority. She moved to the Valley, and worked to continue coaching. 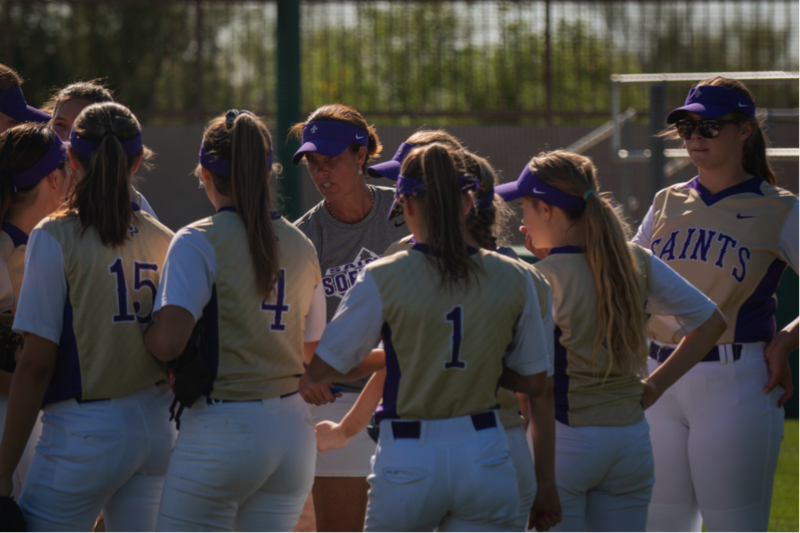 She coached club softball for a few years and held softball clinics around Arizona. Early on, she helped coach the Arizona Thundercats – a club softball program in Tucson. She would drive down once a week and run a four-hour practice for the outfielders. But after about a year, the travel was too much for her to balance while trying to support her family. Instead, she started club softball teams under the Arizona Thundercats in Phoenix. At one point, she was invited to live with a family in McCormick Ranch for a couple of years. “They said, ‘Oh God just put it on our heart and we want to bless you, and see if you want to live in our house,’” Braatz-Voisard recalled. To this day, she counts it as one of the biggest blessings she’s received in her life. It was an experience that really humbled her, and taught her how to receive. “It was really hard at first because I was always, ‘What do I have to do for this? I have to work for it. I have to earn it.’ As an athlete, that’s such your mindset,” Braatz-Voisard said. Fast-forward to the present day, and Braatz-Voisard has been the head coach of the Saints for almost a full season. The private Catholic school has been a great fit for her. At Notre Dame, she’s been able to coach and live out her faith every day. After only a few months, her impact has definitely been felt on the team. 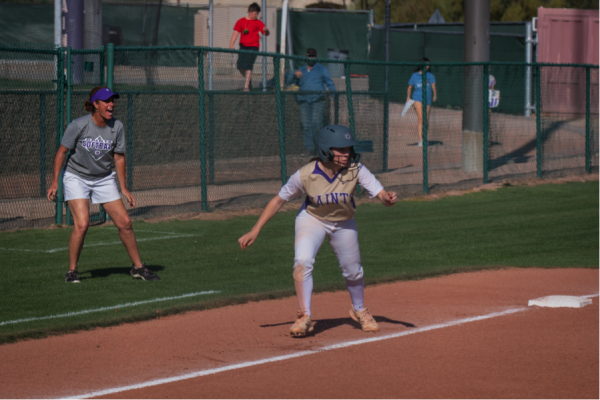 Braatz-Voisard and the Saints finish the season with a game at Maricopa on Monday, and an away-and-home series with region opponent Cactus Shadows on Tuesday and Wednesday.